Hi everyone, Kimberly here. The cold weather seems to be settling in after that beautiful week of warm, sunny weather; I guess that was Indian Summer, and winter really is on its way! The geese that fly overhead in ever larger groups are confirming this prognosis. 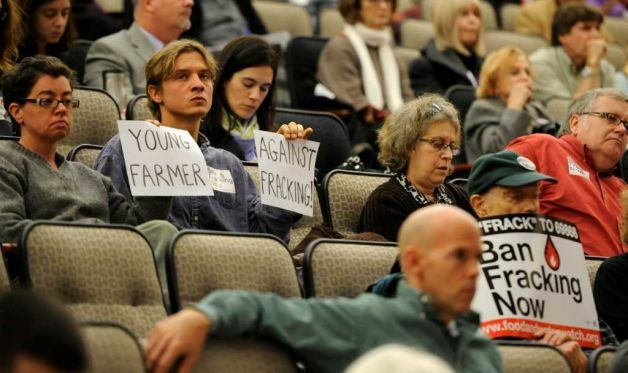 On October 6th, Clemens and I took the morning to attend the NYS Assembly's hearing on hydraulic fracturing natural gas drilling ("fracking") and stayed while they grilled the NYS DEC commissioner, Joe Martens, and his staff. (The photo above featuring your farmer, Clemens, is from the Times Union's coverage of the hearing. You can also catch a glimpse of us at the YNN coverage of the hearing.) I think they did a really solid job of raising all the questions, issues and problems. Many anti-fracking activists were there, and the hearing went well into the night as the Assembly allowed the public to comment and testify for the official record. Back at the farm the broccoli and cabbage are coming in nicely, the peppers in the field are hanging on nicely so far, and the kale and chard are still going strong. The greenhouse tomatoes are doing well, too. However, the peas we planted in the field for fall harvest are not faring so well; the deer came through and ate the tops off almost all the plants. The deer also methodically ate all the heads of lettuce in the field. Deer fencing is a top priority to put in place before the 2012 growing season! This year Clemens and Jenny experimented with drying beans. We pulled up the first plants a couple of weeks ago, and strung them up with rubberbands and rope to hang in the garage. By hanging they should dry out so the pods become papery. The kids are looking forward to when they come down, when they can be stepped on in a large bunch to easily pop open the pods and gather the beans inside. The first batch were calypso beans (also known as orca, or yin yang, beans, see the picture for the reason why) and the batch last week were the gorgeous orangey-tan with deep red swirl tiger's eye beans. We are also still working on preparing the field for winter. Clemens acquired a few large wire spools and welded a bar so it could be attached to the tractor. We were then able to put the spool on the bar and roll the irrigation system's drip tape onto it for reuse next year. This week we will also be taking the clips off the field tomatoes for reuse next year, too. The reemay has been rolled up and just needs storing, except for the few strips being used for the arugula out in the field. This past week we also cut down a number of trees on the road up to the farm in preparation for the heavy equipment that has been hired to widen and regrade the road. The equipment will also be used to clear out the big roots from the land near the greenhouse which was cleared of stumps this year, as part of opening new farm land. I've been updating the website and have posted a number of pictures in the Gallery, please check them out!Lastly, as this CSA season winds down we are very eager to get your feedback on your experience, and are planning a written survey which you can fill out anonymously. Of course we'd love to hear what you loved, but equally important are any ideas you have on what would have improved your experience. Thank you again for investing in the farm this year!